Skate sharpening made easy, the E-Z Sharp Quik Action Skate Clamp simplifies skate sharpening with its quick action mounting system. Skates are fastened in seconds with unfailing accuracy. Built to the specifications of your machine. 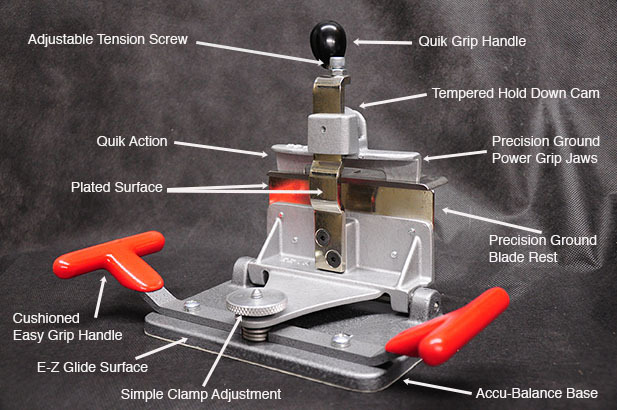 Note: The E-Z Sharp Quik Action Skate Clamp can be designed and manufactured for all types of skate sharpening machines. Skate is fastened in seconds with unfailing accuracy. Just insert skate and clamp with E-Z Sharp’s exclusive power grip. Skate sharpening made E-Z. Single dial adjustments. No complex multiple adjustments causing timely delays, inaccurate sharpening, and unhappy customers. Easy to train new employees to use. Provide the ultimate in balance and control. Virtually eliminates table and clamp base wear. Provides a steady E-Z Glide surface for the ultimate finish. E-Z glide pads attach easily with self adhesive peel away. Precision machined from special steel. Controlled harden and heat treated for maximum durability and holding power. Precision ground with machined surface accuracy. Easy grip handles are positioned for maximum speed, balance, and accuracy. Specially machined jaws provide maximum holding power with ridge blade accuracy. Machined radius for maximum holding power. Contour shaped for fast, positive locking action. Both the blade rest and the clamp arm are plated for maximum durability and continued good looks. All machines & equipment are made in the U.S.A.